The rarest gem in the quartz family is a vivid blue or blue-green microcrystalline quartz known in the trade as gem silica. Sometime referred to as gem silica chrysocolla or chrysocolla chalcedony, it forms in copper-rich areas where the copper silicate known as chrysocolla combines with chalcedony quartz. 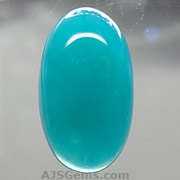 The main attraction of this gemstone is its remarkable color. The intense color is due to the presence of copper salts that penetrate the crystal lattice of colorless chalecedony. Though there are other copper-bearing gems that can display a similar color saturation, such as turquoise and chrysocolla, these are much softer stones and are not durable enough for everyday rings. The term "gem" in "gem silica" indicates that this material is gem quality, and in fact it has a hardness of 7 on the Mohs scale and is suitable for all kinds of jewelry, including rings. But the best gem silica has more than a vivid color. It also has significant translucency that gives it a special glow. Clean specimens with excellent translucency are sought after by collectors. In the Asian market, gem silica is in demand for its resemblance to the highest grades of jade. In the west, the paraiba-like color and rarity are the main selling points. The chief sources for this rare gem are in Arizona, USA and Peru and Chile in South America. These locations are among the main copper mining locations in the world. Arizona is the leading copper producing state in the US, with 60% of the US production. Copper mining is a multibillion dollar business with many industrial applications. Unfortunately with the advent of modern mechanized mining, it is no longer possible to interrupt copper mining to extract the gem silica when a new pocket is discovered. So the only locations yielding new material are those where mining is still carried out with pick and shovel. The main sources of gem silica in Arizona are the Inspiration Mine in the Globe-Miami area, and the Ray Mine in the southern part of the state, about 65 miles east of Phoenix. Due to copper mining practices, neither mine has yielded new material in the last 20 years, and all the material in the market was discovered years ago and put aside or held in family collections. The scarcity of fine material has driven up prices on top grade gem silica as demand from collectors continues to grow. The Inspiration Mine is noted for very fine translucent material which has the distinctive glow prized by collectors. Material from the Ray Mine tends to be opaque, but of a vivid blue color. More recently, we have seen new gem silica from Peru enter the market. The first Peruvian material was quite opaque and olive to forest green in color. But more recently we have seen some fine blue-green stones from Peru, with good translucency. The main source is the Lily mine in Pisco Umay, about 200 km south of Lima. Some of the Peruvian material has dendrite inclusions which form interesting patterns. In the past few months we have acquired rough material from both the Arizona mines as well as from Peru. We have begun the tedious process of sawing through kilos of stone in order to cut the choicest gems. You can see a selection of our finished stones on our gem silica page. Over the coming weeks we'll be adding more pieces to our collection. A superb Chrome Tourmaline from Tanzania in an impressive size. 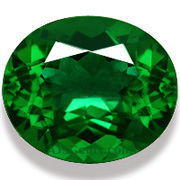 This fine gem is a deep chrome green with exceptional brilliance and fire. The saturation is outstanding, but this tourmaline never appears too dark, even under low light conditions. The clarity is first rate for a chrome tourmaline, and we've graded this gem "almost loupe clean". Lovely portuguese cut with no trace of a window. We have acquired a number of fine imperial topaz from Ouro Preto, Brazil, including some matched pairs and suites. This is the best collection of these rare topaz we've had in a long time. 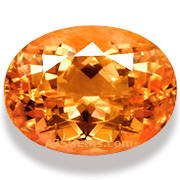 The 5.89 ct oval shown here is an excellent example -- a rich sherry hue, top clarity (graded "loupe clean") and beautifully cut with full luster. See all our fine Imperial Topaz. Until very recently, jeremejevite was one of the rarest minerals in the world. A new find in Namibia has brought a small number of pieces to the market. Most are mineral specimens since facetable material is extremely rare. This 12.80 ct faceted stone is especially rare because of the presence of three phantom cyrstal inclusions. See all our rare Jeremejevite. We have recently acquired some very fine matching pairs and suites in Brazilian aquamarine, such as this elegant pair of long pears. These top grade gems are precision cut, with full luster and no windows. These are exceptionally clean stones in a lovely sea blue, perfect for a gift for that special someone. See all our fine Aquamarine gems. Most fine gems are in very short supply these days. But one of the few exceptions is the excellent opal from Wegel Tena in Ethiopia. We having been buying steadily, but very selectively, picking out the finest pieces in the market. The play of color in many of these stone is amazing, with the full range of colors displayed, often distributed along parallel colums that resemble fingers. You may never see such fine opal again at these prices. See all our Fine Opal. We have just acquired a number of new apatites from the excellent material discovered in Madagascar. 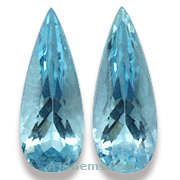 Though a fairly soft stone, apatite is valued for its distinctive color, reminiscient of paraiba tourmaline. 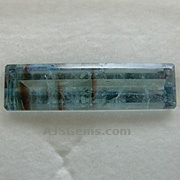 See all our Apatite gems. The long awaited by-elections in Burma (Myanmar) have been completed successfully with Aung San Suu Kyi's NLD winning 43 of 45 seats. Governments around the world responded quickly. The European Union announced that they would suspend all against Burma sanctions for 1 year, but will maintain an arms embargo. Japan has agreed to write off more than $3.7 billion of debt owed by Burma and to resume development aid. The US is taking a slower path; it is upgrading diplomatic ties and plans to allow US investment in some sectors, but only in areas it judges would benefit the broader population. So there is no indication yet that US sanctions affecting Burmese ruby and jadeite will soon be lifted. But as reforms continue to move ahead in Burma, we're hopeful that trade sanctions will be eased by the end of the year. Colored diamonds continue to sparkle at auction. A 9 carat cushion cut pink diamond, known as The Clark Pink (from the estate of Huguette Clark), was sold at Christie's New York for $15.7 million, or $1.75 million per carat. The buyer was Brett Stettner of Stettner Investment Diamonds, an investment fund. This set a new US record for price for pink diamonds. Many colored gem varieties, such as ruby, sapphire, spinel, imperial topaz, tsavorite garnet, etc. are much rarer than diamond. Because colored gems tend to display more vivid color in larger sizes, they are generally cut to to maximize size. Economics is also a factor, especially with the more valuable varieties. So the shape of a finished stone will be determined by the shape of the rough material. Since oval shapes are most common in nature, that is what you will tend to find in finished stones. Round stones, especially in larger sizes, can be quite hard to find, and will often sell for a premium price. Chrysoprase and gem silica chrysocolla are both forms of chalceodony, or microcrystalline quartz. 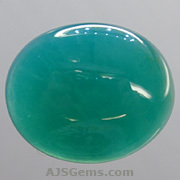 Chrysoprase is typically apple-green and is colored by traces of nickel. Gem silica tends to be a vivid greenish-blue or bluish-green and is colored by traces of copper. Gem silica is more expensive because it is a much rarer gem. But you'll notice a wide price range in gem silica, with the highly translucent specimens costing more. 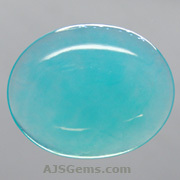 Chrysoprase tends to have less translucency and a less vivid color.